Welcome to Fall and the approach of the family wonders of Thanksgiving and Halloween, folks! 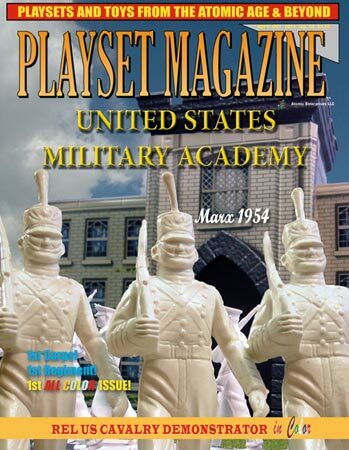 To celebrate the great contributors and centerpiece story for Issue 59, something really special is coming -- the advent of Playset Magazine publishing in Full Color! Here you’ll get a good sense of the remarkable history of the West Point Military Academy (one of our contributors actually works there!) and the grand scale toy making at Marx’ finest. No, it does have conflict – but it has scads of epic tone, lots of great detailed poses, some of the best of the mid 50’s we think and history. Then there are the Generals, magnificent sculpts of six of our best and finest, all educated at the very place honored in this set. It’s a beauty and has, until now, been highly underrated. Here also are some terrific demonstrators. Fist there’s the U.S. Cavalry by Rel – also a highly underrated firm, judging by this awesome display set up and our new full color pages really do it justice! The second is a Western setting with lots of action, cowboys, and Indians, again by Rel. You’ll immediately see why we chose to include these sets in our color issue. But now, we have a confession to make – we held onto this story until we could do it in color, and somehow threw out the baby with the bathwater, so to speak. These were sent in by a reader whom we cannot credit because we have sadly misplaced his name, if it was ever included. So please, perhaps one of you out there knows who it is, and we need to name him. Let us know, with many thanks. One of the happiest times I can recall was spending some good TV in front of an old RCA console set with my parents who thought so much of Gunsmoke that they didn’t shuttle me off to bed early. And there isn’t one of you out there who doesn’t know the Marshall of Dodge City, James Arness, has passed away. In this issue you’ll find our tribute to him. We left the photo black and white because that’s the way we mostly remember him, though we fondly recall him sending a big color shot for our cover some time ago. He will be missed. So the magazine is moving forward, we hope. And that brings up a small point I’d like to make, that we may reprint some of the best of our legacy black and white images on these pages in color, where ever validated by bringing something “new” to the party now that we can do it in color. Case in point, we have published some great store displays in black and white when we can now do in color. Variations in figure colors or accessories is probably also a good reason. There are brand new reviews, too, and highlighted this issue are TSSD’s awesome new Romans with super dooper detail, you will surely want to be the first kid on your block to form your own opinion of just how great these are based upon your personal examination of our first full-color photo reviews which include the New Replicants and Tombstone Figures. In the news, we have a report from the 5th Texas toy show and lots of juicy summer finds. Plus there are some dandy ads offering some terrific vintage toy soldiers and playsets and looks like our free-to-subscriber” classifieds are super full giving some dandy browsing time to readers, and all our favorite advertisers are here with some mighty good offerings as we build up to the big Christmas Issue. This issue has already shipped on August 25th (our exact usual date for nearly 10 years now!) and be delivered to our first class readers during the first and second weeks of September, just in time to help get you ready for the greatest show on Earth, the Old Toy Soldier show in Chicago! Thanks so much for making us a part of your collection.